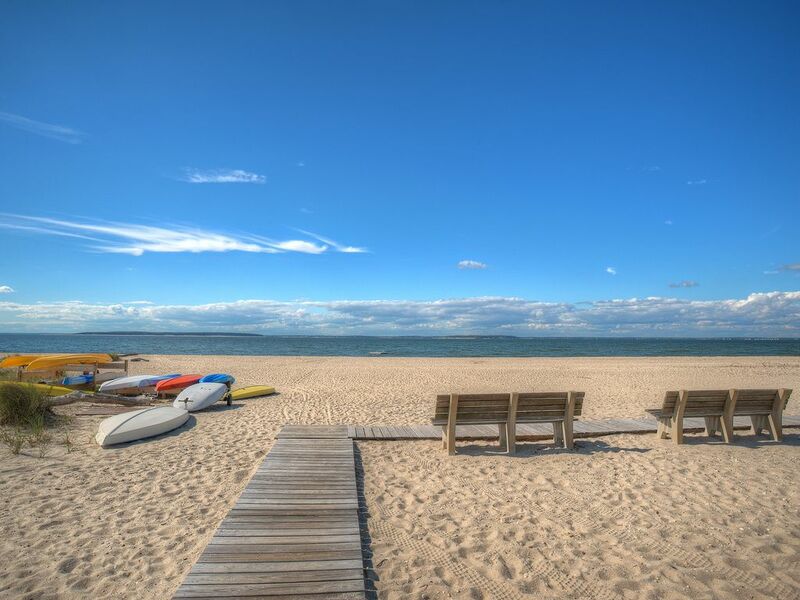 Southampton Shores Oliver w pool, private Shores beach, tennis, fields & deli! Be part of the sought-after Southampton Shores private beach and tennis community in this recently renovated 2-story home with a very private pool, great for entertaining outside in the expansive equally sunny & shaded pool area, on the back deck or inside. Half a mile from the beautiful bay beach with stunning sunsets and countless water activities, this house is a great location, just minutes to Southampton Village, Sag Harbor, Bridgehampton, Water Mill, ocean, and bay beaches, this house is also an easy drive through Sag Harbor to get to East Hampton, avoiding 27 traffic. Wonderful entertaining inside spacious great room/living room (with double height ceiling, sun roofs, and fireplace), back deck, and large very private pool area. Monthly rental prices vary on season; please inquire. *2019 Full Summer Memorial Day to Labor Day: $44,000 plus utilities/services/security. *2019/2020 Year: $49,000 plus utilities/services/security. *2019 July-Labor: $39,000 plus utilities/services/security. Born in Manhattan, I've been coming out to Southampton since I was a baby. I have great memories of my teens and twenties meeting up with friends, heading to the beach, tennis, swimming, clambakes, and lots of fun entertaining evenings. This area will always be special to me, especially for the great friends and unique memories. I specifically wanted a place that was close to my friends in Southampton village as well as Sag Harbor and also one that was within walking distance to the water, with a pool, entertaining space, and access to tennis. This house fits all those and more and gives me an opportunity to entertain a lot of house guests, play as much tennis as I want, and head over to the beach on a whim, practically having the beach to myself with amazing sunsets. It's also a quick drive to Sag Harbor and surprisingly easy to get over to Bridgehampton, Water Mill, Wainscott, and East Hampton via back roads, avoiding the dreaded 27 traffic in the summers. The deli was an added bonus--as a New Yorker used to convenience, having a deli a city block away to pick up egg and cheese sandwiches or to stock the house with breakfast food for house guests (or to pick up a gatorade on the way to tennis) couldn't be more convenient. Private pool plus access to three private club tennis courts, private beach with beautiful sunsets, ball fields; walk to deli. What a great spot! We were lucky enough to find this property on short notice and the owner could not have been more helpful in executing such a perfect weekend for us. We arrived Friday evening and managed to avoid much of the "Hamptons" traffic. The home was nicely appointed, comfortable, stylish furniture, and a fantastic pool and back yard. When not relaxing on the grounds we found ourselves touring the area of Sag Harbor and relaxing by the beach just a short drive away. We also really enjoyed the convenience of the mini mart around the corner. For a last minute trip, we were thrilled with the house, the area, and the weather! Thanks again. We'll definitely return! The location is ideal for water lovers, 1/2 mile from the beautiful bay beach with stunning sunsets and countless water activities. It's also minutes to the Southampton village and ocean beaches, Water Mill, Sag Harbor, Bridgehampton, East Hampton, and the ferry up to Shelter Island; easy access to Montauk via the back roads, avoiding 27 traffic! Great restaurants, fishing, kayaking, canoeing, beach parties, sunsets, hiking, bike paths, and more, all within minutes. Rates are subject to change until reservations are confirmed. Lease will include (in addition to rent) a utility & pool/lawn maintenance deposit, show clause, and security deposit as per standard Southampton Real Estate lease agreements.